All-in-one patch kit & tire lever combo. Durable, refillable aluminum case with press-fit end caps. Power Cap Levers serve as both tire levers with integrated spoke hook and end caps. Lever Kit include a durable and reusable tube stainless steel tube scuffer. 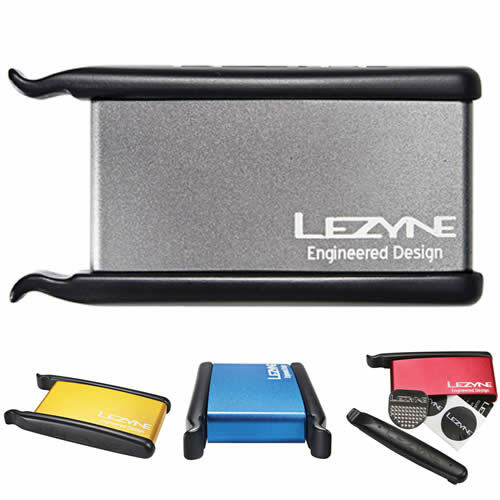 Lezyne glueless patches use a specially developed synthetic rubber compound that stretches and conforms to inflated tubes. Power Cap Levers are made of durable, high-strength nylon composite matrix. Patch instructions have a selfadhesive backing and serve as an emergency tire boot. Clever little kit. Compact and light. Has everything except the pump. The only thing holding it together is friction from the plastic levers. I'll pack a rubber band inside for when that fails. Delivered sooner than expected to the USA. A great idea to have patches etc. packed away in a neat container, looks very stylish too. Not too sure if the tyre levers are effective, I has to use a friends levers during a recent puncture repair as they had more leverage. Compact size and good quality. A must have accessory. Good to slip into the pocket and keep everything together. Even room for some glue and proper patches (glueless never work). Small, light, neat and well made. The Lezyne self adhesive patches supplied work well. Smart compact kit, with everything you need to do road side repairs. Neat size and can get a few extras inside too - money etc. Levers are good and have spoke hook on. Can be a bit fiddly to clip the levers on - but then you'd hope not to have to use it. I am delighted with the repair kit because it comes very well prepared to not spoil patches within. Not seen one that came with a metal kit. Also takes up very little space to go by bike is very important. Many thanks. Perfect compact kit, fits in my saddle pack a treat and is surprisingly robust for such a small kit!